A tale of cannibalism set in the American Civil War. 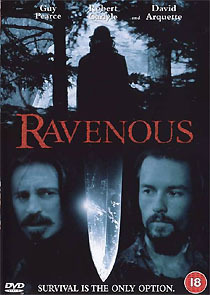 Ravenous is an archly black American Civil War comedy, about a soldier (Pearce) who is sent to a remote outpost, where he encounters a dishevelled stranger (Carlyle) who recounts a startling story about escaping from a group of travellers who have taken to cannibalism. It’s a quirky film, rich in texture and atmosphere: not intense enough for seasoned gore hounds, but might be perfect for someone looking for something a bit unusual. Either way, it's not a film that you're likely to forget in a hurry. Although the film was obviously not graced with a very large budget, the 2.35:1 widescreen transfer is generally clean and sharp, and it scores over the American disc because it's enhanced for 16:9 presentation. The 5.1 audio mix (at 384kbps) is unusually aggressive, heavily pushing the film’s odd score (by avant-garde composer Michael Nyman and Blur’s Damon Albarn). The disc has three separate commentary tracks, including one by Bird and another with the film’s writer, a selection of deleted scenes with optional commentary (12m), and galleries of stills, set and costume designs.